Flooring is one of those things that is everywhere, but we don’t exactly think about it. Yet at every part of every day, there’s something beneath our feet. Flooring comprises so much of our lives, without even realizing it, and because of its near-constant use, it’s important to have flooring that will last, and will work best for your needs and your home. Our kitchens are the heart of our homes. This is where we create, where we try new things, and it’s the place where people come together. There is nothing more magical than sharing a meal with the ones you love, and the warmth from your kitchen emulates the compassion you have for those around you. Even though we don’t necessarily give a lot of thought to the flooring in our kitchen, this is the base and the force that grounds us. It’s what we move about on, where our pets scamper through, where footsteps are paired with serving home-cooked meals and setting the table. The kitchen floor is just as poignant as the kitchen itself, which is why we need the perfect flooring to tie everything together. The Flooring Nook is Rolla’s premier place to get the best in hardwood, laminate flooring, tile, and carpet. We are set on offering you the designs and styles your interior deserves, at a price that your remodel budget loves. Take a look at some of the options for your kitchen flooring, and contact The Flooring Nook to get started! We are Missouri’s Top Rated Local® flooring experts, and we’d be honored to work with you. Call us today! When guests walk into your kitchen, they can tell right away if this was a room designed with warmth in mind. Maybe you have yellows or mellowed reds as a kitchen theme or wall cover, or some incredible backsplash to add depth to the overall feel. Either way, you were likely purposeful with making this room feel reminiscent of your kitchen growing up, and how it made you feel. For flooring to match the warm and welcoming vibes, you’ll want something that has equally rich tones. Take a look at some of our options! Hardwood is most likely your best bet with this style of kitchen. If you’re investing in a kitchen that looks and feels super inviting, you’re likely investing in a room and a home that will stay for awhile. The warm and welcoming theme is a timeless one, and hardwood flooring is a classic that is with you for the long haul. There are several advantages to hardwood flooring, all of which we’ll discuss in more detail in future blogs. But in the meantime, the gist of it involves being the most sturdy and hardy of floorings, which in turn increases your home’s value. In terms of upkeep, hardwood needs to be refinished every several years, but otherwise this surface is extremely durable. In terms of the kitchen, not only does hardwood flooring serve as a great investment, but the natural warmth from the hues within the wood add exquisite depth to your already welcoming space. 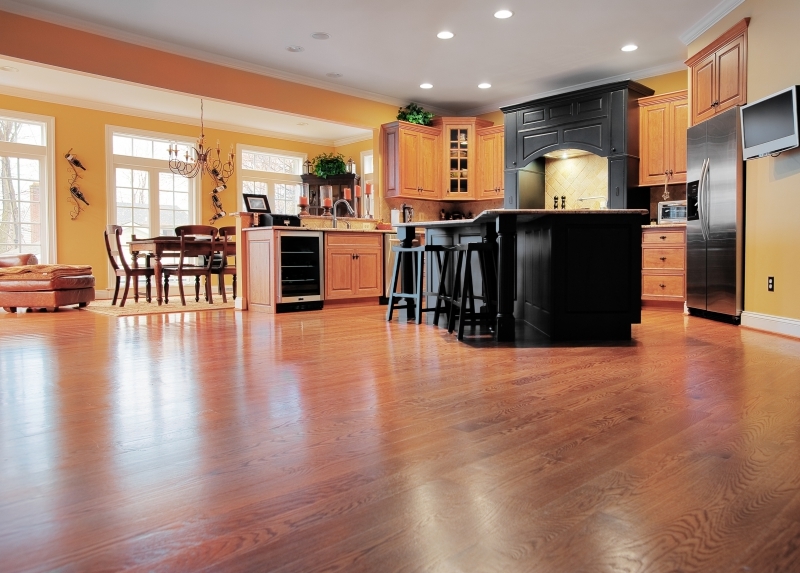 Cherry hardwood flooring is a great option, and one that can complement your warm kitchen exceptionally well. The natural reds in this flooring add richness to your kitchen in the best of ways. For a lighter option that seeks to provide slight contrast, certain varieties of teak or red oak could balance a room out superbly. Talk with the flooring experts at The Flooring Nook to get more ideas! A modern kitchen means you are up on the trends, you are all about staying current, and you want a space that matches current design styles. You might see the kitchen as more functional than anything else, and that’s perfectly acceptable. It is, after all, the place where food and nourishment come from, and that might be more a purpose for you. If this is the case, we go back to functionality as the key focus. You likely have stainless steel appliances, darker cabinetry, or more greys and cooler tones to tie the room together. Laminate flooring might serve as the best flooring for you in this instance. Laminate flooring emulates hardwood, but is less expensive, still highly durable, and easy to install. Look for laminate flooring with cooler tones that still provide balance to your kitchen as a whole. The balance to strive for is between light and dark, with subtle hints of hues in between. If your cabinetry is darker, find laminate flooring that is a lighter grey, and stick with lighter colored countertops and surfaces. For lighter surfaces and cabinetry (especially if they’re white), a charcoal or dark grey laminate would be a fantastic flooring option. Darker tile in a solid color would be another excellent option for a modern-styled kitchen. A classic kitchen is where old and new collide. With a classic kitchen, you might feel inspired by tradition, and see this area as a place of production that has withstood the tests of time. You want something that’s inspired by the past while still being presented in a relevant way. With a classic kitchen, similar color schemes are key. Whereas a kitchen with warmer tones will have colors that play off of each other and a modern kitchen will have varying shades of cooler tones, a classic kitchen hits its mark with a more monochromatic style. Everything will be in the same spectrum of creamier colors and richer browns, and the emphasis will be more focused on the subtle embellishments throughout. Certain cabinet handles, islands with columns and paneling, and other architectural designs will be the main event, and flooring will need to help in highlighting these details. Hardwood flooring is once again going to be a good option for you, with surfaces and materials that will fit more into the monochromatic scheme of the room as a whole. To have a similarly colored kitchen will by no means come across as stale or dull—rather, the effect creates a more holistic and well-rounded look. Stick with walnuts or chestnuts for hardwood flooring that enhances the space as a whole. Even though we might forget about it, the flooring in our kitchen drives the feel and look of this space in a subtle, yet powerful way. Fortunately, there are countless options for choosing your kitchen flooring, any of which would work wonderfully at creating the kitchen you most desire. The Flooring Nook is more than happy to help; providing you with design consultation, hardwood and laminate flooring, and all the guidance you need to create the space you’ve dreamed of. Your kitchen is ready to be completed—contact The Flooring Nook today to get started.